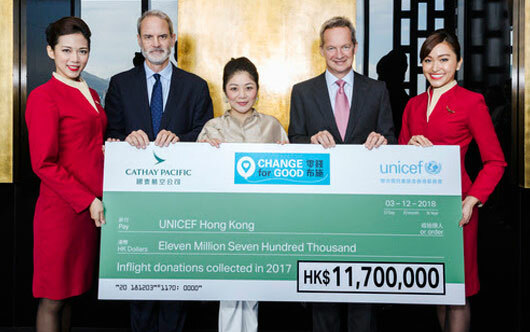 The Cathay Pacific Group and the Hong Kong Committee for UNICEF (UNICEF HK) announced that a total of HK$11.7 million (approximately $2 million) was raised from the Change for Good inflight fundraising program in 2017. Since its launch in 1991, the program has successfully converted spare change from Cathay Pacific passengers into supplies and services to improve the lives of vulnerable children worldwide. Pictured, Cathay Pacific Chief Executive Rupert Hogg (second from right) and Director Customer Simon Large (second from left) present the 2017 Change for Good donation to UNICEF HK chairman Judy Chen (c).